It is a Saturday afternoon. I am about five years old. My father gathers up the four of us kids and piles us into the Plymouth station wagon and drives us to a big unfamiliar building, where he drops us off and drives away. I am the youngest, and in the care of my older siblings. We walk into the building to a big room that is magical to me. People are dressed in costume, there are games to play and prizes to win! Ice cream! Cotton Candy! Peanuts! Popcorn! I hardly know what to do first. I find out that we are in a place called "Temple." I like Temple! A few weeks later we are at our parents' friends house and they are talking about meeting us at Temple for Friday night services. Their daughter, who is a couple of years younger than I am, asks "What is temple?" Well, I know what Temple is, because I was just there! "You'll love it!" I say. "There's ice cream, popcorn, games, and people wear costumes. It's like the circus!" I am so pleased that my age and experience have allowed me to help explain something new to someone who is younger and less worldly than I am, something I never get to do at home. We get to Temple. We go in the same doors I had gone through that last time, but imagine my surprise when we do not turn towards the big room with all of the fun and games. Instead, we turn left and head into a bigger, much more quiet room with rows of benches and a big raised area at the front with large wooden chairs, a big wooden stand, and a curtained area in the back. Everyone is wearing suits and dresses, and goes quickly and quietly to sit in the benches. There is soft organ music playing as people enter and find a place to sit. Even at five, I am old enough to realize immediately that I have made a mistake. We are not sitting with my parents' friends, though, so I cannot tell the daughter that I made a mistake, what I had described was obviously some special occasion and not business as usual at temple. But I could not, so I just quietly hoped for the best, and figured I would explain it to her at the end of services. But she was young enough not to grasp the subtleties of what had occurred. And in the middle of the service, when everyone was standing for silent prayer, she asked in a loud, confused, plaintive voice, looking around across her father's shoulder (he had picked her up when everyone stood) "Where's the ice cream?" I wish I could say I had learned my lesson and that it was the last time I ever, with the best of intentions, led anyone astray but alas, it was more like the first of many, many times it would happen. There are some who would say I do it to this day, I'm sure. You may have realized by now that my first experience at Temple was Purim, the holiday that celebrates the deliverance of the Jewish people in Persia from the evil plot of Haman to destroy them. My first visit to Temple was for a Purim festival. How was I supposed to know it was not business as usual? And I will also say that Temple was never that much fun again. And I don't remember going to any more festivals like that, although we did dress up in costumes for Purim, and one year we made hamantaschen. 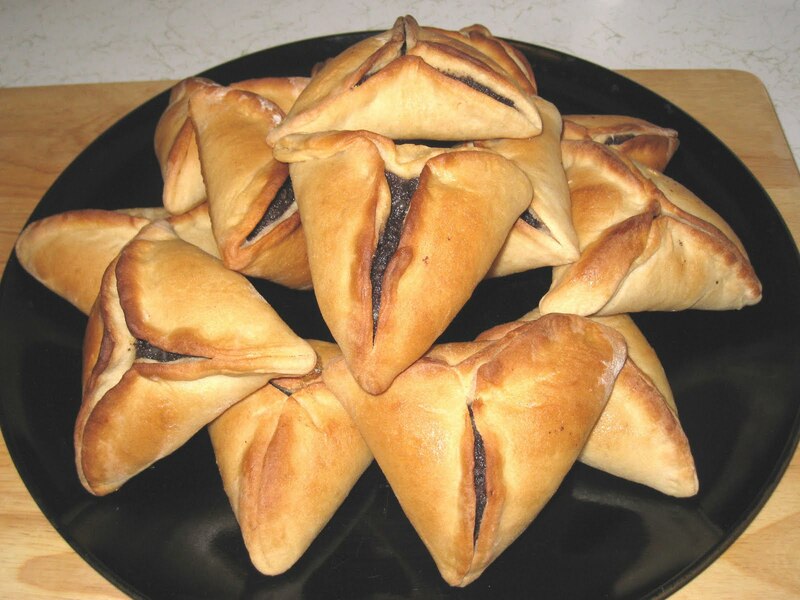 If you are not familiar with hamantaschen (and I would not expect you to be if you are not Jewish), they are poppy seed or apricot-filled cookies (or pastries) that represent the tri-cornered hat for which Haman was reportedly known, and are the traditional food of Purim. They are also said to represent the ears of Haman, but hat is what I learned so I am sticking with that. My memories of hamantaschen were the cookie. You rolled out a sugar cookie, cut it into circles, put a spoonful of filling in the center, and folded the edges in to make the triangle. But when I went looking for recipes, I found a yeasted pastry version that intrigued me, even though it was not in my tradition to use this version. But I have been having so much fun with yeast that I wanted to give it a try. And I am glad that I did. It turns out that the dough is the same recipe that I used for these sweet rolls. They just get rolled into a different shape, and filled with a poppy seed filling instead of a fruit jam (although those can also be used to make hamantaschen). The recipe yielded a few dozen of the hamantaschen and I still had half of the dough left. 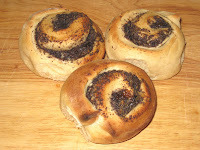 I was running out of time (and yes, ok, I was feeling lazy), so I just rolled the rest of the dough into a rectangle, lined it with the rest of the poppy seed filling, rolled it up and cut it crosswise into 1-inch pieces, and baked up a batch of poppy-seed rolls. Bonus! Purim begins at sunset on Wednesday, March 7th, and ends at sunset on Friday the 9th, so you still have time to crank these babies out for this year's celebration. Or, if you're like me, bookmark it so you can make them next year. Either way, you won't be sorry. Dissolve the yeast in warm water. When the milk is scalded but still hot add the butter, sugar, salt, nutmeg and lemon zest. Cool until it is lukewarm, then add the beaten egg. Stir in the yeast and about half of the flour. Add enough of the rest of the flour in small increments to form a soft dough that can be kneaded. Do not add too much flour. Knead the dough until it is smooth and elastic. Place the dough in a large bowl and cover it tightly. Let it rise until doubled in size, about 1 hour. Turn the dough out of the bowl and roll it into a rectangle that is about 1/4-inch thick. Preheat the oven to 400 deg. F.
Cut the dough into 4-inch rounds and place them on a baking sheet lined with parchment paper. Brush the edges of each circle with oil and spread about a teaspoon of the poppy seed filling on each round. Fold three sides of the circle to meet over the filling and pinch the edges together to make a triangle. Brush the tops with warm honey and let rise for about 30 minutes. Bake for 20 to 25 minutes, until golden brown. Start checking after 10 minutes. Thank you for this. The tradition in our family was alway to make this yeasted kind filled with poppy seeds and pinched entirely closed. I was trying to explain this to a friend who wants to make them. Your photo is very helpful. Looks almost exactly the way my mother (and grandmother) used to make them. I am glad this was helpful. I grew up with the cookies which, while good, were nothing special to me. I much prefer this yeasted version and it seems more traditional to me. I pinched them all closed when I was shaping them and most of them came apart in the oven. I wasn't sure if I should have sealed them more securely or if they were supposed to open up somewhat. I decided that I liked them to be slightly opened.